Today I went for a 7km run in what was forecast to be cool and overcast. I decided to take my new sun-hat and sun-t-shirt just to try them out for comfort. I was glad that I did, because it turned out to be quite clear, hot and sunny. I was pleased to learn that these new items work really well, kept the sun off my head and helped to keep me cool. It’s not long now until my marathon weekend on 5th/6th May. Please help raise money for Marie Curie by sponsoring my first marathon in memory of “my third grandparents”. This route is quite varied, with some road, track, fields, uneven ground and mud. I was also pleased to note my best time for this particular route, having maintained a moderate pace, with no stoppages or “walking breaks” – apart from a few gates and foot-bridges – a total stoppage time of just 15 seconds. Tomorrow I hope to make a much longer run. Today’s run was in simulation of the main event – since on the bank-holiday Sunday there will be a 5km run, before the 42km marathon on the Monday. As usual, I ran in a fasted state. I felt good and full of energy. I didn’t suffer like I did on my previous run in the warm weather, which whilst that was a much longer run – I felt struggled with the sun on my head almost as soon as I began. This is all reassuring – since my run is in May and could be almost any temperature – I hope for cool though! In other news – my running bib for the marathon came through. I am runner number 1762. There is no turning back now!? Onwards and upwards… thank you for your support! First of all – thank you so much to everyone who has helped me raise money for Marie Curie by sponsoring me on my marathon run on 6th May. I am overwhelmed by the support and kind words – and the very generous anonymous donations too – thank you – whoever you are!! With just three weeks to go I can’t help being a bit nervous about the challenge ahead. This feeling has some panic atop, as over the last two weeks I succumbed to a “dreaded lurgy”. Was it a cold? Flu? Or worse – MAN FLU? I don’t know, over ten days or so it manifested itself in just about every way, one day after another. So, reader, I apologise for the lack of recent updates. The good news is I am on the mend. The positive part of my brain says the good news is I am far less likely now to be ill at marathon time. My immune system should be prepared for anything! The bad news is that I am behind with my training. An unexpected outcome from all of this came on Saturday 13th when I attended a local Parkrun (free, weekly 5km timed runs that take place around the world – managed by generous volunteers and donations – see https://www.parkrun.org.uk/). I decided to try out a 5km run because I knew I was on the way out of my “lurgy”, even though I still felt tired, achy, and not on top form. I really wanted to be sure that after two weeks of rest from my training – that I could actually still run. The results surprised and encouraged me, because I actually ran my fastest ever 5k, and include within that I broke my fastest ever kilometre and mile. It seems that despite not being totally well, the rest did me good. Another surprise was in the data. 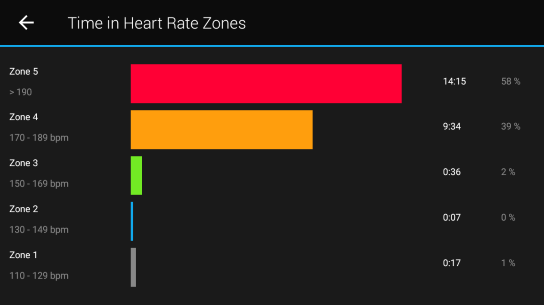 Unlike practically all my previous runs over the last two years, I spent the majority of my time (58% of the run) in heart rate zone 5 – which for me is over 190 bpm. This is normally my sprinting zone that I move into in short bursts, to overtake, or for a sprint finish. Somehow, I managed to sustain this for longer than ever before. Was it due to rest? Due to illness? A measurement error? I don’t know! After the run, I also felt far more energised – and a lot less ill! Bonus! During my “down time” I had some more time to consider the details of the day – the route, the weather, my kit, etc. 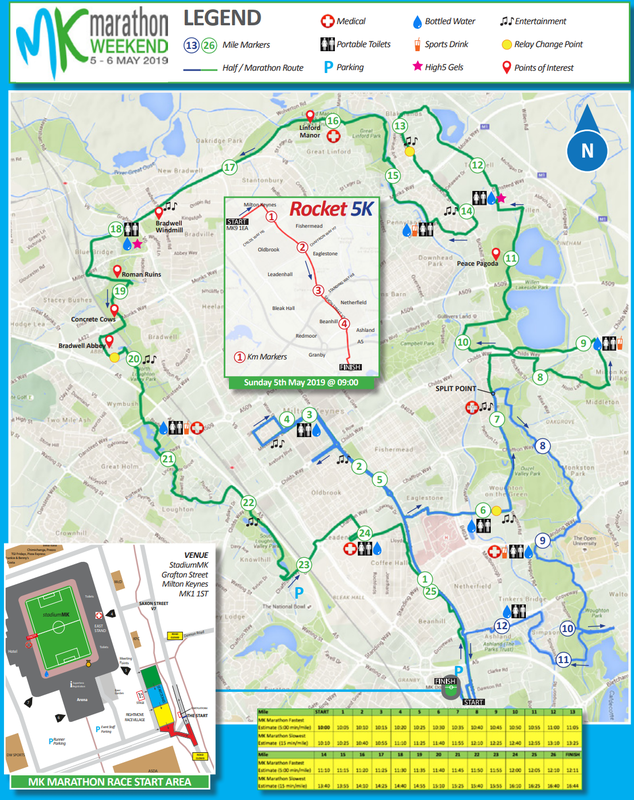 The full marathon takes place the day after the “Rocket 5K” on the 6th May. Of course, it’s May – it could be cold, wet, hot, snowing – who knows? With my recent experience of running in the sun and running in hypothermic wind / rain I now respect the weather more than ever before. So, I have taken some time to prepare a kit for wet and windy, or hot and sunny (and something in between). If it’s a bright day, you won’t be able to miss me with my very bright, UV protective sun hat, t-shirt and sun glasses (I am sure, I will look very cool of course 😂😂😂). I am still working on the wet and windy kit. I have some waterproof socks that I have tested out (they work well), will likely wear a polyester (quick drying) t-shirt, but would like to find a super-lightweight waterproof jacket. What would be my preferred weather? Whilst most people will be hoping for hot, sunny bank holiday BBQ weather, I will be hoping for a cold, dry and overcast morning – once I cross the line – then I’ll definitely join everyone else in the hope for BBQ weather! I sustained a bit of an injury today, which I hope will not cause me problems. I learned that, it’s not all that sensible at 40 years old, to perform BMX style jumps on a mountain bike, when trying to impress your three-year-old daughter – especially in the weeks before a marathon. Hopefully, my shin isn’t as bad as it looks. Thanks, silliness. I hope still to have one more chance at a long practice run, though most experts tell me it is getting a bit late for that. Given I have had two weeks out however, I feel I have some catching up to do. I have a few other shorter training runs lined up, and a few more preparations and gear to get together. Not long to go! Please – wish me luck! I had mixed feelings about my training run on 29th April. I managed to run 23km (14 miles) in unexpectedly warm weather (about 18°C, that felt like 30!). I tried hard not to neglect the fact I had run over half a marathon in the warmest temperature I had ever ran in, whilst part of me went on about how I had “only” made 23km of my 35km (22 miles) target! Training is of course about learning and experience. I learned that running in the heat is a lot harder than in the cool, and that I may need to make adjustments or additional preparations given my marathon run is in early May – a particularly unpredictable time of year. The route was mostly open with little protection from the direct sun. To get through this 23km, I stopped for a few seconds here and there in available shade, drank more water than usual and took a few “walking breaks”. As I approached what would have been the turning point on my planned route (Watermead Lake) I felt familiar early symptoms of sun stroke – headache, unquenchable thirst, etc. I decided it was wise to call it quits before I did any real damage. Still, onwards and upwards – it looks like it will cool off somewhat next week so I will make my next 35km attempt soon. In the meantime, I will see what headgear might help me in future. I’ve been trying to carve out some time to get some new running shoes, and I finally did it last week. I was aware I had left it quite late, with only a few weeks to go. I got to test them out on this 23km (and a couple of short runs) and all is well so far. I know though that any small issues with running shoes often don’t show up until a few hours in so we will see. But I am quietly confident! I visited “Up & Running” in Milton Keynes, who were very helpful and patient in providing a “gait analysis” and persistent in trying out numerous shoes until we found the ones that fit my peculiarly shaped, oversized feet! I’m often asked what I am eating before and during my longer runs. With just a few weeks to go I am having to be a bit stricter about my diet, not just what I eat but also when. Did I mention that I like spinach? As I have previously experienced eating the wrong foods the day before a run really makes a difference – for me bad food means heartburn – which is awful on a run. It is important that I don’t eat too close to bedtime either. I try to stick with the basics that conform to the macronutrients, micronutrients and electrolytes I am after (“what do I eat?”). For example, on the day before my 23k last week, I had a quality beef steak (grass-fed, from Kings Farm Shop, Wendover), organic spinach, homemade mayonnaise (made with quality olive oil) – and some black pudding! I usually only have one or two meals a day. It’s an interesting side effect of a low carb diet – because fat is more satiating and difficult to overeat (unlike sugar) one tends to only eat when truly hungry, rather than out of habit. Some days I have breakfast, but most days I will have some lunch. On other days, I only have dinner. It depends on how I feel. What I actually eat for breakfast or lunch are often quite similar. I usually have some nuts (such as walnuts, brasils), cheese, eggs, spinach. I might have some homemade low-carb bread (a specialty of my wife! ), or homemade low-carb crustless quiche (a specialty of my mum!). As I am running on fat without sugar on the day of a run – provided it is not too late in the day – I am fully fasted (I do not eat anything). This optimises fat-energy delivery by keeping insulin low and maximising glucagon and ketones. The only exception is I may consume a mug of skimmed “bone broth” purely for minerals, electrolytes and hydration (it is almost calorie free with nothing added). During the run I drink water with a predefined mix of salts – again to maintain electrolytes and hydration which is particularly crucial during a fasted, ketogenic state. After my run I find the need to allow my stomach to “wake up” for an hour or so before I break my fast, and I do so by having a light low-carb snack (and probably a coffee with cream!). I plan to attempt my 35km training run again within the next ten days. I have also taken up regular cycling as an alternative exercise and continue to go out on shorter (<12km) runs when I can. I should probably also go and find a suitable sun hat! Thank you so much to everyone who has helped me raise money for Marie Curie by sponsoring me on my marathon run on 6th May. I am overwhelmed by the support and kind words – and the very generous anonymous donations too – thank you – whoever you are!! Having met my target weight on a ketogenic diet back in 2016, and having discovered many health benefits of this lifestyle I had no desire to go back to my old ways. However, I continued to lose (too much) weight. After some research I discovered the solution was to start working out (particularly resistance / weight training). Having been sedentary for most of my life I found this quite daunting. But in 2017 I discovered that my new diet provided me with more energy than I had felt in decades. I started weight training which stabilised my weight, and later with my excess energy I started treadmill running. In September 2017 I headed to the gym before breakfast and randomly ran 21k over 2:12, stopping not because I could not continue but because I had to get to work. It was then I discovered the nature of “fat-adapted” energy delivery. Since then I have been studying, testing and experimenting to work out the optimal method to keep myself running – without carbs or sugar. How far can I go with this? My primary goal on my diet is to keep my insulin levels low. I’ll explain more about why later. To achieve this, I predominantly consume foods with a low-GI (Glycaemic Index) – probably lower than most would consider low. I thus avoid all sugars, carbohydrates (especially refined or processed), most fruits, and starches. I favour natural fats and proteins. My secondary aim is to maintain a low level of body inflammation, which I will also explain more later. To achieve this, I avoid inflammatory foods. Rather conveniently, there is quite a cross over between high-GI and inflammatory foods (which I do not believe to be a coincidence). I avoid sugars, vegetable / seed oils, processed foods, fake fats (esp. trans fats), refined carbohydrates, and alcohol. I favour whole foods rich in nutritious and well formed, natural fats that are dominant in saturated and monounsaturated fats, whilst avoiding polyunsaturated fats. These foods also happen to include an appropriate amount of natural proteins. My macronutrient goals that work for me, having been refined over years of experimentation are 10% carbohydrate, 20% protein and 70% fat. (My average over 2017 came to 12%/34%/54% respectively however). Roughly speaking I observe the micronutrient guidelines, but I take them with a pinch of salt (literally) for reasons I will explain later. I like to eat a variety of foods that I believe will give me everything I need. I am a big fan of quality meats and dairy products of all kinds. (By the way, it is possible to achieve all the above as a vegetarian, if meat is not your thing.) I try to buy organic wherever possible, because what animals eat and are exposed to really does make a difference to its nutritional properties. Whilst not a huge fan of “greens” I do eat cabbage, spinach, green beans and other leafy “above ground” produce. I eat a lot of eggs, which I believe are probably amongst the most nutritious thing we can eat (eaten whole, preferably organic). I enjoy high fat (low sugar) yoghurt and berries (strawberries, raspberries, blackberries), and 90-100% dark chocolate in moderation. I like eating nuts. I eat too many salted peanuts, but otherwise walnuts. I cook in real butter or olive oil, favouring frying as there is less loss of nutritious fat in the process. My wife kindly makes a whole host of amazing recipes and we thus enjoy a great variety of meals. Probably the worst thing I ever eat is KFC – my vice. I only ever eat the chicken and very rarely the “sides”. KFC is not the highest carb take-away, but it is highly processed and contains numerous inflammatory ingredients. It doesn’t happen too often, so I do not worry! The spreadsheet below details everything I ate in 2017 (yes really). It was a very arduous process, especially given this diet doesn’t include a lot of things out of packets – meaning every new recipe had to be weighed and analysed at ingredient level. I used MyFitnessPal. Sometimes things had to be reasonably estimated, sometimes I had to make reasonable data substitutions where no data was available, so this is a rough guide. All this could have ended in divorce, had my wife not the patience of a saint. In addition I consumed a lot of great homemade meals too so whilst these numbers are interesting they do not reflect my diet as a whole. My diet has also changed a fair bit since 2017. In all I consumed approximately 16 kg of carbohydrates, 46 kg of protein and 75 kg of fat. That’s 12%, 34% and 54% respectively. This is a more protein than is generally recommended for an LCHF (Low Carb High Fat) diet. This works OK for me generally, but when I am aiming for performance I target a more ketogenic 10% / 20% / 70% or even 5% / 15% / 80%. After all that fat all year – how much weight did I put on? ?